A range of events for almost all runners. Entries for the Dig Deep Peak District Races 2015 and Dig Deep Suffolk Races 2015 are now open! The Mammut Dig Deep Peak District races – 15th/16th August 2015. There are four classic trail races to choose from, taking in the most spectacular and technical terrain the Peak District has to offer. With the Race HQ at Whirlow Hall Farm, the Dig Deep Peak District Races are only 15 minutes from Sheffield, with plenty of public transport links. We are proud to have Mammut once more as our headline sponsors for the whole event, Trail Running Magazine as our media partners and the wonderful Outside as our retail partners. The event will once again be supported by Clif, Injinji & Ultimate Direction. The Ultra Tour of the Peak District (UTPD) is making a name for itself as one of the most gruelling and technically challenging ultramarathons in the UK. With 2772m of ascent, and navigation essential, the UTPD requires plenty of trail experience and training miles. The most famous climb on the route is the Parkin Clough/Win Hill climb from Yorkshire Bridge with a gradient of 32%. The past two years have seen a dropout rate of around 30% of the startline. There will be navigation courses and ultra training lectures throughout the year in the run up to the event. The Peak Intro Trails offers trail and road marathon runners a challenging opportunity to step up to ultra marathon distance. It’s not easy, with steep climbs and some navigation required but who wants easy? The terrain and the views are spectacular, and the route takes in some of the finest trails in the Peak District. 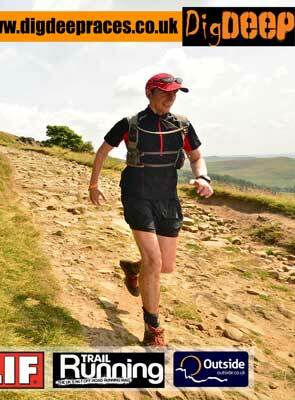 Expect to run through moorland, forest, past lakes, crags and over the famous Stanage Edge. 2 classic trail races around the Burbage valley, no navigation required, early booking recommended as places for these fly fast! 2014 saw the launch of the Dig Deep Suffolk trail race weekend, with some incredible times set across all 4 races. With great feedback and an incredible turnout for a first event, the 2015 event will build upon the success of this year, with Trail Running Magazine now confirmed as the 2015 media partner and sponsor and Clif, Ultimate Direction & Injinji also sponsoring all 4 races. The race HQ is situated at the the beautiful Wantisden Hall, with nearest transport links in Woodbridge, the Dig Deep Suffolk races are only a couple of hours away from London. An accessible 50 mile ultra, with the course running over a diverse range of trails and through a variety of landscapes, from coastal trails and forests to fields and moorland. This ultra is suitable for those looking to push their ultra distance, some navigation is required. The course is a fast one with the record currently set at 7:43:12. It’s an ideal course for those looking for a 50 mile PB! Another beautiful route that winds through the ancient Rendlesham forest and along the old sailors trail around Snape Maltings – famous for it’s brewery (wait for after the race!). If you are looking to step up from marathon distance or moving from road to trail this is a relatively flat course with wide open trails and some navigation required. 2 shorter distance trail races, suitable for everybody! No navigation required. We had a great turnout for the 2014 races, a fantastic atmosphere with lots of running groups, canicross-ers and family and friends supporting.